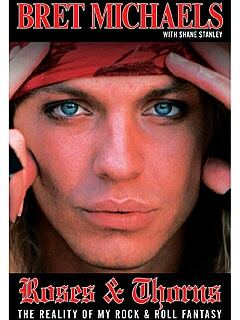 Poison vocalist Bret Michaels has posted the following news to remind fans that his upcoming autobiography is available for pre-order. “Thank you all for your participation in the poll for the upcoming autobiography “Roses & Thorns”. Remember the book will be released June 23 and you can pre-order your copy from Amazon.com. April 4 at Northern Lights in Clifton Park, NY This show is ages 16+ with ID or legal guardian. Please check the profile at www.myspace.com/bretmichaelsofpoison for the full schedule of tour dates! Keep in mind, you can click on any show for address and ticket info.